The Fine Arts Booster Group (FABG), an affiliate of IPEI, will hold a general meeting Thursday, October 25, 2018 from 5:30 – 7:00 p.m. at the Ithaca High School Chorus Room, 1401 N. Cayuga Street. The Fine Arts Booster Group supports all the arts in all the elementary and secondary schools in the Ithaca City School District (ICSD).The meeting is open to parents/caregivers, staff, students, and community members. Ithaca, N.Y., September 25, 2018 - Ithaca High School social studies teacher Keith Thompson is one of 38 highly accomplished U.S. teachers awarded a Fulbright Distinguished Awards in Teaching fellowship for the 2018-2019 academic year. 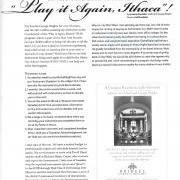 Article / photos reproduced with permission of ‘Cayuga Heights Living’ magazine, Sept 2018 issue. The Fine Arts Booster Group (FABG), an affiliate of IPEI, has mini-grants available for dance, drama, music, and visual arts projects that engage students. The Fall 2018 deadline is October 15, 2018. Ithaca City School District (ICSD) teachers and principals are eligible to apply. Applications are available online at www.fabgithaca.org/receive , by phone 256-4734, or email FABGgrants@ipei.org. Grant applications are submitted electronically. FABG Ad Sponsorship Campaign Set to Begin - Support Arts Education! The Fine Arts Booster Group (FABG), an affiliate of IPEI, is seeking advertising sponsors for its 2018-2019 performance program booklets for Ithaca City School District (ICSD) secondary schools’ events including concerts, dramas, and musicals at Boynton Middle School, DeWitt Middle School, Lehman Alternative Community School and Ithaca High School. Display ad space is available for sponsors who would like to support FABG activities throughout the ICSD. Contact the boosters at ads@fabgithaca.org. Thank you Saltonstall... Teachers, glad you had wonderful retreats....Next year we will do it again! The wonderful Saltonstall Arts Colony offers teacher residency retreats during our winter and spring breaks. We are happy to continue the partnership again next year. FABG provides grant support for this great opportunity.